Powers/Abilities: Presumably granted at least some degree of power from Thasaidon, Vacharn can generate a mystic "Dark River," which draws ships from the nearby ocean to the isle of Na'at, where the ships are crashed upon Na'at's jagged, white reefs. He reanimates the dead as his servants. In some cases, he could preserve these servants' youthful appearance and vitality, but most others appeared clearly corpse-like, and they rotted and were fed upon by maggots. The servants spend half of their time in stone coffins, coming forth in daily resurrections to do their masters' tasks. He can immobilize and then direct the actions of others with hand gesture, and none save Conan (with supreme effort and only after the slaying of one of his last surviving friends) could overcome this. He activates his domicile's lamps with the command "Yadar." From behind an arras (tapesty) marked with arcane symbols of Thasaidon, he views the outer sea and its ships, and the lands beyond, via a vaguely triangular mirror, which "flamed brightly as if lit by some splendor of unknown origin." He could apparently only do this the noon before the night of a full moon, and he was virtually entranced when gazing into the mirror, rendering him vulnerable to assault. 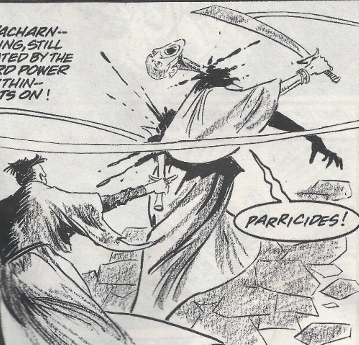 Able to survive and still control his body even fully decapitated, though piercing his heart with a powerfully enchanted blade is apparently sufficient to finish him off. In addition, he used a chemical or magic poison that could paralyze a victim on contact. He also had a galley able to navigate against the pull of the Dark River. Vacharn utilized the demon-familiar Esrit, though Esrit was willing and able to feed upon Vacharn and his sons given the chance. He was served by numerous reanimated servants who acted as laborers, guards, and warriors as needed. Uldulla and Wokal could generate powerful winds and could dispatch undead servants with a blast--presumably anything his sons could do collectively, Vacharn could do by himself (though the servants were generally under his control above and beyond both sons' efforts to control them, so it is unlikely he would need to dispatch these servants, but, you never know). Hair: Bald with sparse dark hairs sprouting from atop his head. (Conan the Savage#10 (fb) - BTS) - Vacharn is presumably descended from Atlanteans who fled the sinking land during the Great Cataclysm of 18,000 BC and reached the "continent" of Zothique. Zothique obtained "as high a level of civilization as any you could have seen. Death and sorcery were intimately entwined in Zothique. (Conan the Savage#10 (fb) - BTS) - Vacharn came to dwell in the isle of Na'at, off Zothique's east coast. (Conan the Savage#10 (fb) - BTS) - Presumably via a pact with Thasaidon, Vacharn obtained Esrit as his demon-familiar for a given term, receiving in exchange, at the full of each moon, the blood of a living man, chosen for redoubtable strength and valor. 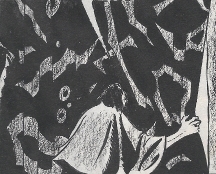 (Conan the Savage#10 (fb) - BTS) - Each month, on the forenoon of the feeding, from behind an arras (tapesty) marked with arcane symbols of Thasaidon, Vacharn peered, apparently entranced, into his magic mirror that yielded visions of the outer sea and its lands beyond. (Conan the Savage#10 (fb) - BTS) - Via a mystically generated "Dark River," Vacharn pulled many ships to crash upon the reefs of Na'at. He reanimated the dead as his servants, keeping any strong enough to survive as a feast for Esrit. After the first such crash/harvest, his already existing servants routinely recovered the ships' captains for Esrit. (Conan the Savage#10 (fb) - BTS) - Vacharn spent much of his time pursuing ancient books of magic. Some of his reanimated servants tilled his rocky gardens, others tended his goats and cattle, while still others were sent as divers into a ravening sea not to be dared by living swimmers, bringing back the pearls that were the source of Vacharn's great wealth (see comments). (Conan the Savage#10 (fb) - BTS) - Legends of the Dark River made it to Antillia, where it was described as the "River of the Night." 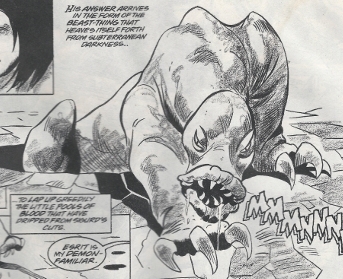 (Conan the Savage#10 (fb) - BTS) - Antillians "flimsy galleys" only rarely survived the trip from their land to Na'at. (Conan the Savage#10 (fb) - BTS) - Dalili came to Na'at along with the crew of the vessel in which she sailed from Oroth, on the mainland of Zothique. (Presumably after) fathering Uldulla and Wokal through her, Vacharn slew and then reanimated her to preserve her youthful beauty and faithfulness for his lusts forever. (Conan the Savage#10 (fb) - BTS) - Vacharn, Uldulla, and Wokal forged at least four scimitars over time, which were tempered in a muttering of lethal runes, and inscribed later with unspeakable death-spells. (Conan the Savage#10 (fb) - BTS) - Vacharn maintained strict rule over his sons, forbidding them to address anyone in his presence without his leave. (Conan the Savage#10 (fb) - BTS) - As Uldulla and Wokal grew old themselves, they progressively resented Vacharn's authority over them, feeling he had lived beyond his allotted term and that it was only rightful that they should inherit his stored treasures and magical supremacy...before age had debarred them from their enjoyment. (Conan the Savage#10 - BTS) - As Conan, captain of the Winged Dragon, led his crew westward from Antillia in hopes of reaching Mayapan, the necromancers Vacharn, Uldulla, and Wokal generated the Dark River to pull them to crash on Na'at's reefs. All aboard perished except Conan and Sigurd, who were saved by the reanimated servants. Even Yasunga, who had been lost in the waters during an earlier storm, became one of the necromancers' undead servants. (Conan the Savage#10) - Vacharn, along with Uldulla and Wokal, greeted Conan after Dalili dragged him to shore. Vacharn made the introductions, revealing the nature of Dalili and their servants. Silencing Uldulla and Wokal when they spoke, he taunted Conan with his reanimated crew; as Conan angrily charged him, Vacharn entranced Conan with a gesture, forcing him to join in a trek back to the necromancers' granite domicile. There Vacharn had his servants bring wine and food before Sigurd, greatly weakened in the wreck, was brought before them. Conan warned Vacharn not to hurt him, but Vacharn considered Conan in no position to make threats. Despite Conan's warning, Sigurd, weakened and parched by the briny water he swallowed, tasted the wine Vacharn offered, intending to detect any poisons before drinking fully, but succumbed nonetheless. As Sigurd froze, paralyzed, Vacharn summoned Esrit, who climbed atop and fed on Sigurd while Vacharn taunted that Conan would be next month's feast. As Sigurd perished, Conan overcame Vacharn's spell, tore Esrit free, and hurled it to attach itself upon Vacharn himself. Briefly screaming in agony, Vacharn drove off Esrit with a mystic burst, causing it to flee back into its hole. Encouraged by seeing Vacharn bleed, Conan advanced on him, but Vacharn set his reanimated servants on Conan, and they overwhelmed him with numbers (and blunt weapons). Conan was cast into a stone cell. The next dawn, Vacharn led Conan on a brief tour of their island, after which Conan was kept in the cell when not in the banquet hall with Vacharn and his sons, who rarely spoke, and upon the sea cliffs, watching the reanimated servants diving for riches. On the last day before the full moon, Uldulla and Wokal summoned Conan away from sea cliffs, offering him a ship, which they would use powerful enchanted gales to help him reach Zothique, if he would help slay Vacharn. The next day, they freed Conan from his cell, gifting him with one of their mystically-empowered scimitars. When one of the reanimated corpses warned that only Vacharn could release the prisoner this day, Uldulla and Vacharn combined their power to dispatch the servant. They then led Conan to find Vacharn behind his arras (tapestry) of Thasaidon, where he stared immobile into his mirror. As Conan rushed, a blinding light erupted from the mirror, so that, though Conan's scimitar struck harshly into flesh and bone, it failed to decapitate. Having kept his own scimitar close at hand, Vacharn swiftly struck back, only grazing Conan but nonetheless paralyzed him via its mystic runes. Wokal sprung forward, nearly decapitating Vacharn, who fought on, mystically animated by his own wizard power. After Wokal struck him in the back, Vacharn blundered into his mirror and sprawled to the floor, but when Wokal rushed in for he kill, Vacharn impaled him with his scimitar. As Esrit climbed from his hole and fed upon Wokal, Uldulla rushed forward and sliced the final tether of flesh holding Vacharn's head to his body. Surviving nonetheless, Vacharn's body struck out, slicing Uldulla's calf with the scimitar, after which his hands found Uldulla and strangled him. At last able to move, a dazed Conan skewered both necromancers; Uldulla was already dead, and the piercing of Vacharn's evil heart finally slew Vacharn. Esrit leapt at Conan, but Conan stabbed one of the enchanted scimitars through its neck, killing it as well. 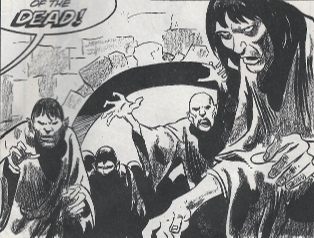 The shambling dead approached, and they obeyed Conan's orders to pile the sorcerers' and demon creature's body and set them afire. Conan then ordered Dalili, followed by Sigurd, Yasunga and the rest of this crew, into the fire, freeing them of their damned servitude and sparing Conan their haunted gazes. Needing a crew to sail from Na'at, Conan kept alive a number of the previous servants and set off for Zothique. Comments: Created by Roy Thomas and John Buscema. Titled "The Necromancer of Na'at," the credits in Conan the Savage#10 list it as a sequel to the Marvel Graphic Novel Conan of the Isles based on the book by L. Sprague DeCamp & Lin Carter. 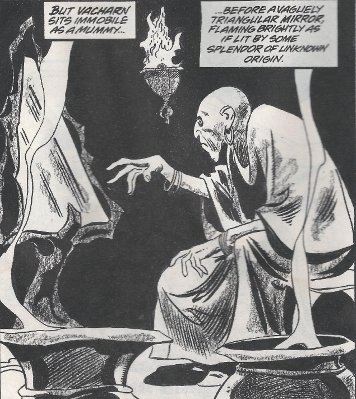 Conan the Savage #10, or "The Necromancer of Na'at," was freely adapted from "Necromancy in Naat" by Clark Ashton Smith. 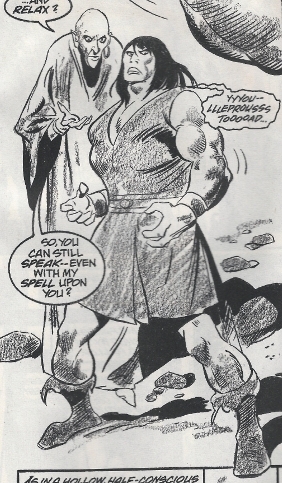 Many of the stories from the Conan comics were freely adapted from tales written by other authors, replacing the heroic male lead with Conan and placing the events during the Hyborian Age. In this case Prince Yadar became Conan. This tale originally took place near Clark Ashton Smith's Zothique, which was not the Hyborian Age North America, but rather the far future, where all the continents had remerged as the supercontinent Zothique and magic had returned to a declining human race. Marvel apparently it was intended to adapted several of Clark Ashton Smith's tales to Conan, occurring in his later years after Conan of the Isles. Whereas Mayapan was an authentic Hyborian Age land mentioned in Conan of the Isles, the lands of Mayapan, Zothique, and Poseidonis were all placed in Clark Ashton Smith's tales. Alas, only "Necromancy in Naat" was ever adapted. The Conan Chronology in Conan Saga #95 only hints at what was intended to come but was sadly never produced. 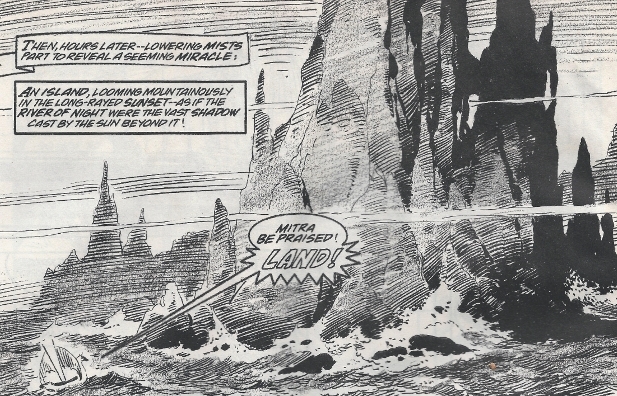 It is unclear to me whether it is an all new story subsequent to Conan of the Isles, which was adapted from DeCamp and Carter's Conan of the Isles, OR whether it adapts a later part of DeCamp and Carter's Conan of the Isles not covered in Marvel Graphic Novel, which covered only the Antilla adventure, as covered to some degree in the profile on Xotli. And/or, does the Conan of the Isles novel go on to cover the adventures hinted at in Conan Saga #95, traveling to Mayapan, Zothique, and/or Poseidonis? Yadar is homaged by Roy Thomas in this story as a magic word spoken by Vacharn to activate the lamps within his immense granite dwelling. 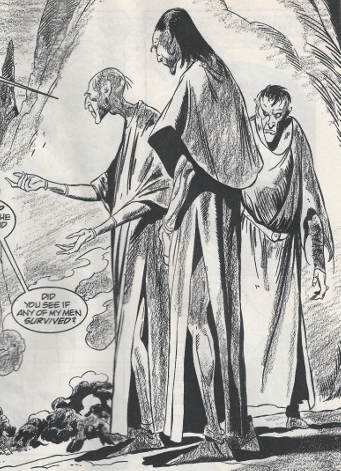 Another of Vacharn's mystic commands, "Agor," was the name of someone else from Smith's original story. Not sure what Vacharn's use was for the wealth obtained by the pearls. The father lived with his two sons and a legion of deceased servants to serve as workers and warriors. I guess he may have periodically wanted to purchase materials from the mainlands, or he just liked the idea of hording wealth. When Wokal noted that the scimitar they were giving Conan was "tempered in a muttering of lethal runes, and inscribed later with unspeakable death-spells," Conan replied, "as long as it's sharp." Another word for tapestry, the arras (tapesty) was marked with arcane symbols of the archfiend Thasaidon; behind it, Vacharn accessed his mystic mirror to view the world beyond the island. Note: I 'm not sure what, if any connection there is to the Ape-Lord Thasaidon. (Conan the Savage#10) - When Vacharn and his sons used the Dark River to pull Conan's ship to crash onto Na'at's reefs, Dalili saved Conan from drowning, dragging him to the shore. As Conan revived, she ignored his questions, after which Vacharn revealed her true nature. When Uldulla and Wokal revealed to Conan that Dalili was their mother, they told him they believed she would rejoice to see their father finally laid to his grave. As Vacharn and children perished and Conan had them set afire, Dalili shed a tear, after which she readily walked into the fire herself and was consumed in flames. Presumably granted at least some degree of power from Thasaidon, Vacharn can generate a mystic "Dark River," which draws ships from the nearby ocean to the isle of Na'at, where the ships are crashed upon Na'at's jagged, white reefs. (Conan the Savage#10) - As Conan, captain of the Winged Dragon, led his crew westward from Antillia in hopes of reaching Mayapan, the necromancers Vacharn, Uldulla, and Wokal generated the Dark River to pull them to crash on Na'at's reefs. All aboard perished except Conan and Sigurd, who were saved by the reanimated servants. Even Yasunga, who had been lost in the waters during an earlier storm, became one of the necromancers' undead servants. Vacharn's immense domicile was a darkened, granite dwelling deep within the isle of Na'at. 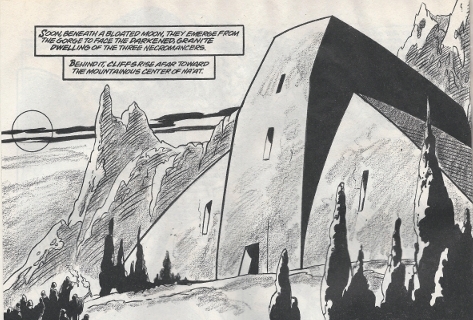 It was largely maintained by Vacharn's undead servants, though some features, such as the lighting were activated by a mystic word, such as Yadar in the case of the lights. Demon-familiar of Vacharn, it undertook to serve Vacharn for a given term, receiving in exchange, at the full of each moon, the blood of a living man, chosen for redoubtable strength and valor. It dwelled within a cavern beneath a hole in the granite floor, awaiting Vacharn to summon it with the simple call of its name. It was also drawn to the spilling of living blood and might emerge under its own directions in such occasions. Given the chance, it was more than happy to feed on Vacharn or his sons. It could be banished by Vacharn via a mystical burst following the command/spell "Esrit--Agor! (Conan the Savage#10) - Vacharn summoned Esrit to consume the blood of the drugged Sigurd. After lapping some of Sigurd's blood (from wounds incurred during shipwreck), Esrit affixed itself to a still-bleeding wound on Sigurd's neck, draining Sigurd's blood and life, causing him to visibly shrivel. As the last flicker of life faded from Sigurd, Conan fought free of Vacharn's restraining spell, pulled Esrit free, and hurled it to attach itself upon Vacharn himself. Briefly screaming in agony, Vacharn drove off Esrit with a mystic burst and the command "Agor," causing it to flee back into its hole. Later, after Wokal was impaled by Vacharn while trying to slay him, Esrit climbed from its hole and fed upon Wokal. After Vacharn slew Uldulla and Conan slew Vacharn, Esrit leapt at Conan, but Conan stabbed one of the enchanted scimitars through its neck, killing it as well. The shambling dead approached, and they obeyed Conan's orders to pile the sorcerers' and demon creature's body and set them afire. Adorned with sails of funereal purple and lacking any apparent crew, it ignored the pull of the Dark River, which drew Conan's ship to Na'at. Uldulla and Wokal later showed Conan a galley, which "resembled" the galley he had seen earlier, promising it and the winds to help him escape the Dark River's pull if he helped slay Vacharn. With the deaths of Vacharn, Uldulla, & Wokal, Conan led a crew of reanimated servants to head for Zothique, presumably aboard one of these galleys. It is unrevealed whether the mirror itself was powered by Thasaidon or other means. An island off the east coast of Zothique, it was the home of Vacharn and his sons, Uldulla and Wokal. They used the Dark River to pull ships to crash upon its shores and then reanimated the drowned crews as undead servants. Magic items (swords of sorcerous might), they could wound or slay the necromancers who created them, as well as the demon-familar Esrit. Even a glancing blow was sufficient to paralyze a non-mystic being. (Conan the Savage#10) - On the forenoon of the full moon, Uldulla and Wokal freed Conan from his cell, gifting him with one of their mystically-empowered scimitars. As Conan rushed Vacharn, a blinding light erupted from the mirror, so that, though Conan's scimitar struck harshly into flesh and bone, it failed to decapitate. Having kept his own scimitar close at hand, Vacharn swiftly struck back, only grazing Conan but nonetheless paralyzed him via its mystic runes. Wokal sprung forward, nearly decapitating Vacharn, who fought on, mystically animated by his own wizard power. After Wokal struck him in the back, Vacharn blundered into his mirror and sprawled to the floor, but when Wokal rushed in for he kill, Vacharn impaled him with his scimitar. As Esrit climbed from his hole and fed upon Wokal, Uldulla rushed forward and sliced the final tether of flesh holding Vacharn's head to his body. Surviving nonetheless, Vacharn's body struck out, slicing Uldulla's calf with the scimitar, after which his hands found Uldulla and strangled him. At last able to move, a dazed Conan skewered both necromancers; Uldulla was already dead, and the piercing of Vacharn's evil heart finally slew Vacharn. Esrit leapt at Conan, but Conan stabbed one of the enchanted scimitars through its neck, killing it as well. According, at least, to the link above, Vacharn's sons in Smith's original stories were Uldulla and Vokal, rather than Wokal. Not sure what the significance behind this is. (Conan the Savage#10 (fb) - BTS) - Dalili came to Na'at along with the crew of the vessel in which she sailed from Oroth, on the mainland of Zothique. After fathering Uldulla and Wokal through her, Vacharn slew and then reanimated her to preserve her youthful beauty and faithfulness for his lusts forever. 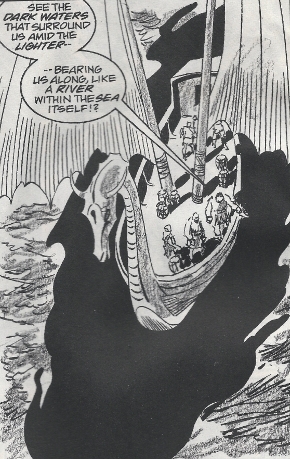 (Conan the Savage#10 - BTS) - As Conan, captain of the Winged Dragon, led his crew westward, Vacharn, Uldulla, and Wokal generated the Dark River to pull them to crash on Na'at's reefs. All aboard perished except Conan and Sigurd, who were saved by the reanimated servants. Even Yasunga, who had been lost in the waters during an earlier storm, became one of the necromancers' servants. (Conan the Savage#10) - Vacharn, along with Uldulla and Wokal, greeted Conan after Dalili dragged him to shore. Vacharn made the introductions, revealing the nature of Dalili and their servants. Silencing Uldulla and Wokal when they spoke, then entranced Conan with a gesture, forcing him to join in a trek back to the necromancers' granite domicile. As Vacharn had his servants bring wine and food before, Wokal noted the arrival of Sigurd, greatly weakened in the wreck, brought before them by other undead servants. When Conan refused "to eat with dogs," Uldulla urged Vacharn to make Conan eat with them, but Vacharn told him to feed his mouth or close it. Despite Conan's warning, Sigurd succumbed to the wine's poison, after which Vacharn summoned Esrit who fatally drained Sigurd. Wokal warned that Conan was breaking free of Vacharn's control, which Conan ultimately did before being subdued and imprisoned by the undead servants on Vacharn's order. On the last day before the full moon, Uldulla and Wokal summoned Conan away from sea cliffs, offering him a ship, which they would use powerful enchanted gales to help him reach Zothique, if he would help slay Vacharn. The next day, they freed Conan from his cell, gifting him with one of their mystically-empowered scimitars. When one of the reanimated corpses warned that only Vacharn could release the prisoner this day, Uldulla and Vacharn combined their power to dispatch the servant. They then led Conan to find Vacharn behind his arras (tapestry) of Thasaidon, where he stared immobile into his mirror. As Conan rushed, a blinding light erupted from the mirror, so that though Conan's scimitar struck harshly into flesh and bone, it failed to decapitate. Having kept his own scimitar close at hand, Vacharn swiftly struck back, only grazing Conan but nonetheless paralyzing him via its mystic runes. Wokal sprung forward, nearly decapitating Vacharn, who fought on, mystically reanimated by his wizard power. After Wokal struck him in the back, Vacharn blundered into his mirror and sprawled to the floor, but when Wokal rushed in for he kill, Vacharn impaled him with his scimitar. As Esrit climbed from his hole and fed upon Wokal, Uldulla lunged forward and sliced the final tether of flesh holding Vacharn's head to his body. Still surviving, Vacharn's body struck out, slicing Uldulla's calf with the scimitar, after which his hands found Uldulla and strangled him. At last able to move, a dazed Conan skewered both necromancers; Uldulla was already dead, and the piercing of Vacharn's evil heart finally slew Vacharn. After Conan slew Esrit, the shambling dead obeyed Conan's orders to pile the sorcerers' and demon creature's body and set them afire. Conan then ordered Dalili, followed by Sigurd, Yasunga and the rest of this crew, into the fire, freeing them of their damned servitude and sparing Conan their haunted gazes. Needing a crew to sail from Na'at, Conan kept alive a number of the previous servants and set off for Zothique. The undead servants generally seemed to be bereft of mind and spirit, but Dalili wept upon the burning of her husband and sons' corpses, and Vacharn noted that the newest servants (Conan's former crew) would initially watch the older servants to learn what to do. At least one of the servants, upon one occasion, could speak a warning against freeing Conan on the day of his planned sacrifice. (Conan the Savage#10) - After Dalili dragged Conan to shore, Vacharn made the introductions, revealed the nature of Dalili and their servants, then taunted Conan with his reanimated crew. Vacharn entranced Conan with a gesture, forcing him to join in a trek back to the necromancers' granite domicile. There Vacharn had his servants bring wine and food before Sigurd, greatly weakened in the wreck, was brought before them by other servants. As Sigurd was fatally drained by Esrit, Conan overcame Vacharn's spell, but Vacharn set his reanimated servants on Conan, and they overwhelmed him with numbers (and blunt weapons). Conan was cast into a stone cell. The next dawn, Vacharn led Conan on a brief tour of their island, revealing the reanimated servants' daily activities. Thereafter, Conan was kept in the cell when not served by the undead servants in the banquet hall with Vacharn and his sons, and upon the sea cliffs, watching the reanimated servants diving for riches. When Uldalla & Wokal freed Conan, one of the reanimated corpses warned that only Vacharn could release the prisoner this day, Uldulla and Vacharn combined their power to dispatch the servant. After Conan slew Vacharn and Esrit (with both Uldulla and Wokal having perished in the attempt), the shambling dead obeyed Conan's orders to pile the sorcerers' and demon creature's body and set them afire. Conan then ordered Dalili, followed by Sigurd, Yasunga and the rest of this crew, into the fire, freeing them of their damned servitude and sparing Conan their haunted gazes. Needing a crew to sail from Na'at, Conan kept alive a number of the previous servants and set off for Zothique.